Install Bubbling Rocks for Tranquility and Relaxation at Home - Legends Landscape Supply Inc. Simply put, bubbling rocks are rocks with water bubbling out of them! Holes drilled through the rocks allow tubing to be installed; water is pumped through the tube to gurgle or flow out through a hole in the top of the rock and splash down the sides. The water collects in a hidden basin so that it can be pumped back through the rock in a continuous cycle. Many bubbling rocks are actually manufactured out of composite material with a surface finish designed to look realistic. The best bubbling rocks are made from real boulders or rocks. They will look the most natural and realistic because they are. Real bubbling rocks are virtually indestructible; while the pump or plumbing will need occasional maintenance, the boulder will last forever. Place your bubbling rocks close to a patio or outdoor seating area where they will be easily seen. They can be incorporated into a larger water feature or serve as a standalone attraction. They will look best if they are within a landscape bed with planting and, perhaps, more rocks and boulders. Some may wish to put bubbling rocks near the front door or an entry courtyard. This is also a nice way to use them. They will be noticed every time you leave the house and serve to welcome you when you arrive back home. The operational part of your bubbling rocks will be mostly hidden. A large plastic tub or a pond liner can be used to create a basin for the recirculating water. The basin will need a screened top or grate that allows water to flow back into it. This is usually disguised with smaller stone such as river rock that becomes part of the overall water feature. There will also be a pump and hose or tubing that sends the water through the rock. A control on the pump allows you to change the speed of the water flow, making it more or less active. These components are often sold together as a kit. This makes the installation easier; you can be sure that the parts are all designed to work together. Keep in mind that you will have to dig a hole for the pond basin to be completely hidden. There also needs to be an electrical source reasonably close by. Landscape planting can help to hide any of the components that are not underground. Modify the design of the landscape around your bubbling rocks feature to make it naturalistic, contemporary or traditional, whatever works best with your home. Your local landscape supply company can answer any additional questions about the details of the installation. We are all naturally attracted to water. It is soothing and refreshing to all of the senses. 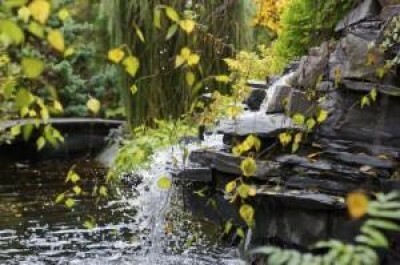 Adding a bubbling rocks water feature to your backyard landscape will turn it into a true backyard escape. Give us a call or visit our showroom today to see the bubbling rocks we think will fit with your landscape.